A choice of Standard or Comprehensive tool kits. Both tool kits which include standard and specialist tools in order to service portable fire extinguishers. 1kg spring balance, 20kg spring balance, strap wrench, 10" adjustable spanner, 24oz rubber mallet, torch, wire brush, swivel C spanner, set of metric spanners, set of metric allan keys, 3 x Pressurising Bars (TG, Gloria, Jewel), plain screwdriver, philips screwdriver, petroleum jelly, gauge test pump (wika), gauge dots, corrective action required labels, tamper seals (500). 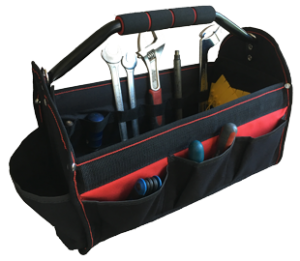 As a tool holdall is a personal choice the one pictured is for illustrative purposes only and is not included but can be purchased separately by clicking here. Maintenance Labels can be purchased separately. These labels are personalised with company details and logo. A choice of finish is also available. They can be purchased by clicking here. Anyone involved in the servicing of portable fire extinguishers should be qualified and competent to do so (BS5306:3-2017). We provide a Fire Extinguisher Maintenance Course. Delegates upon completing the course and successfully passing a BAFE written and practical assessment will be qualified to service and maintain portable fire extinguishers and will receive an industry recognised qualification and certificate.